Accessory ONLY. 1 x Compatible Battery. Compatible Battery. Never run out of battery power when you are about to score the winning point. Integrated microchip prevents overcharging & lengthens battery life. 1X 3600mha battery. Note: Light shooting and different displays may cause the color of the item in the picture a little different from the real thing. Includes battery and screwdriver for opening up the Nintendo GB SP. 1 x Battery. Color: Green. Model: XBOX ONE. 1 x USB Charging Cable. With the battery, get enough joy! Length of Cable: 80cm / 31.50". Due to the different monitor and light effect, the actual color of the item might be slightly different from the color showed on the pictures. Nintendo: DS Lite. Compatible with: Nintendo DS Lite. NOT compatible with: Nintendo DS/ DSi/ DSi LL/ XL. Accessory ONLY. Nintendo DS Lite not included. 1 x Compatible Battery. Compatible Battery. Never run out of battery power when you are about to score the winning point. Product type: Lithium-ion Battery. 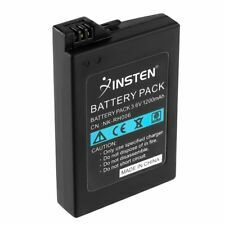 Capacity: 2210 mAh 8.2Wh (Lithium ion Battery). 1 Battery. If you do not receive our reply within 48 hours, pls. Original parts - keep the integrity of device. Take the worry out of playing your for Wii U Tablet with our long lasting battery! 1 x For Nintendo WiiU Battery. Easy 5 minute installation with the included screwdriver will make your life a breeze! High quality and durable. 1 USB Cable. Easy and quick installation. Simply Remove your old or broken one and put on the new one. Cable Length:71CM/28". Due to the difference between different monitors, the picture may not reflect the actual color of the item. Close the bottom cover then fasten the screw. Specially designed for Nintendo 3DS only. Advanced lithium-ion technology, keep 3DS working at optimum performance. 1 x Rechargable Battery for Nintendo 3DS. Integrated circuitry ensures safe operation and long lasting battery life. Power: 3600mAH. 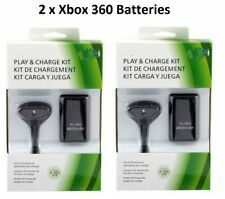 Microsoft: Xbox 360, Xbox 360 Slim. NOT compatible with: Microsoft Xbox, Xbox One. Compatible with: Microsoft Xbox 360. Color: Black. 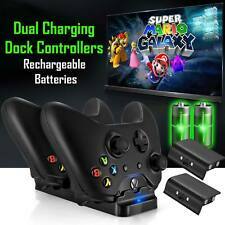 2400mAh Rechargeable Replacement Battery Pack for XBOX ONE Controller +Cable ! Capacity: 2400mAh. Cable Length:90cm. 1 x USB Cable. Detail Image. We will try our best to reduce the risk of the custom duties. Lithium Ion Battery. The manufacturer does not necessarily endorse use of these products. Compatible with GBA® SP. Colour: Black. 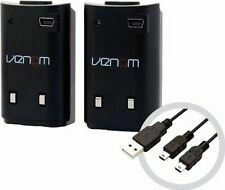 Capacity: 1350mAh/4.99Wh. 1x Battery. Part No. : 4-168-108-01, 4-195-094-02, LIP1450, LIS1441. Nintendo 3DS 2DS Console. Nintendo 3DS 2DS. Capacity : 2000mAh. Battery Type : Li-ion. 1 x Battery. Nintendo 3DS LL/XL Console Consolee. Nintendo 3DS LL/XL. Battery Type : Li-ion. 1 x Battery. Warranty: Full One Year ( 12 Months ). Capacity: 600mAh / 2.22Wh. 1 600mAh Battery. You can use the Baixt External Battery to make your cell phone battery life last longer. Li-ion battery. 1× 2400mAh lithium battery. The entire operation involves plug in a micro USB charging cable either while you're playing on your device, or afterwards. 1× Charging cable. Anyway we will try our best to avoid this kind of thing. We'd like to settle any problem in a friendly manner. High quality and durable. Product List: 1 Battery, 1 USB Cable. We want to make sure you are happy with our item. Goods without RMA number will NOT be accepted. Due to it having a different battery connector. Fit Model. 3.7 V / 840mAh. Compatible with DSi™. Lithium Ion Battery. ●High quality cover fits flush to the edge of the console. High quality cover fits flush to the edge of the console. Anyway we will try our best to avoid this kind of thing. 4800mAh capacity. Don't throw it into water. The product is ergonomically designed, compact and lightweight. Applicable products: For NDS XL. Scope of application: battery. 1 Battery. If you do not receive our reply within 48 hours, pls. If you are satisfied with our service, pls. Sony: PlayStation 3, PlayStation 3 Slim. Never run out of battery power when you are about to score the winning point. Compatible with: Sony PlayStation 3. Capacity: 2400mAh. We will try our best to reduce the risk of the custom duties. Weight: approx. Color: Black. First original power bank for Nitendo Switch: high-capacity 10000mAh capacity Lithium-ion polymer rechargeable battery provides the maximum amount of keeping your devices play time when off the grid and to take a small backpack for the Switch to solve the problem of battery life; Compact, detachable back mount design lets you easy slide to detach or lock for charging Built-in type-c cable and type-c port provide high-speed charging and recharging simultaneously, smart plug-in and plug-out identification, current line compensation and upto 92% conversion efficiency; Smart recharging current adjustment to work with all types of charging adapters; And four LED lights for battery level indication（25%, 50%, 75%, 100% ), power lower... . Size: 63 x 140 x 36 mm(Charging Dock). Battery: 300 mAh (each). 2 x Battery. 1 x Dual Charging Dock Station. -Long Life built in NI-MH battery with over 500 charging cycles. -RED LED light indicates charging. Detail Image.